WASHINGTON--(BUSINESS WIRE)--A new employment study prepared for the Japan Automobile Manufacturers Association’s U.S. office (JAMA USA) by Rutgers University Economics Professor Thomas J. Prusa, PhD, shows Japanese-brand automakers generate 1.52 million jobs throughout the U.S. The study, entitled “The Contribution of the Japanese-Brand Automakers to the United States Economy,” provides a comprehensive look at the robust, longstanding investments by Japanese-brand automakers in the U.S. economy and U.S. workforce. “Dr. Prusa’s latest study confirms what we have long understood: Japanese-brand automakers’ commitment to America yields tangible benefits for families and communities across the country,” says JAMA USA General Director Manny Manriquez. “We’re proud that Japanese-brand automakers' cumulative direct U.S. employment has increased nearly 28% since 2011, compared to a six percent growth rate in overall U.S. manufacturing employment over the same time period,” says Manriquez. 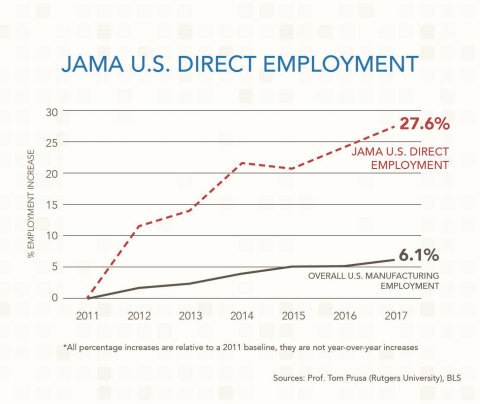 “These figures prove beyond the shadow of a doubt that JAMA members are a vital force in the U.S. economy, with nearly four decades of sustained investment in manufacturing alone. This long-term commitment demonstrates the enduring strength of the U.S.-Japan economic relationship, and we urge leaders in Washington, D.C. to keep this in mind as they consider trade policies that will impact the trajectory of the American auto industry, of which our member companies are an integral part." About JAMA’s Washington, D.C. office (JAMA USA): JAMA USA is the U.S. branch office of the Tokyo-based Japan Automobile Manufacturers Association. To learn more about JAMA USA, visit our website at jama.org or follow us on Twitter at @JapanAutosUSA.